Weight Watchers has been helping people lose weight for over 45 years. Rather than counting calories or banning certain foods, the Weight Watchers diet uses a system based on points. All foods have their own specific point value and, depending on your height, weight and activity levels, you will be allowed to eat a certain amount of points each day. You are free to eat anything you like so long as you do not exceed your daily points allowance. According to Weight Watchers, a medium slice of honey roast ham has 1 point. A medium slice is approximately 35 g and is what you would buy pre-packaged to put in your sandwiches from the supermarket. A slice of canned ham also has 1 point. Parma ham is lower in points and so is wafer-thin ham. For ½ a point you could have a slice of Parma ham or 30 g of wafer-thin ham. According to the U.S. Department of Agriculture, ham is one of the leanest types of pork available and is recommended in sandwiches instead of the more fatty options which include bologna and salami. The USDA advises you to choose a variety with low amounts of added salt. You can do this by checking the sodium levels on the product ingredient and nutritional information label. For 1 point you can have a 25-g slice of chicken, turkey or beef. This is 10 g less than the amount of ham you are allowed for the same number of points. According to Weight Watchers, the values for wafer-thin ham, chicken and turkey are the same, at ½ point for 30 g.
Gammon is another form of ham and is an alternative to beef steaks or pork chops at dinner time. According to Weight Watchers, a medium-sized, lean gammon steak has 5 points. Beef steaks and pork chops also have 5 points. Serve gammon with a medium-sized jacket potato and point-free vegetables such as broccoli, carrots, cauliflower and cabbage. The potato contains 2.5 points, so the total for your meal will be 7.5 points. Make a ham and bean mix for a 5-point lunch or dinner. Place any no-point vegetables such as an onion, mushrooms, zucchini and peppers in a saucepan along with 1 tsp. of oil. Allow the vegetables to soften before adding a can of tomatoes, a small can of baked beans and two slices of ham cut into bite-sized pieces. Once the mixture is piping hot, serve and eat immediately. 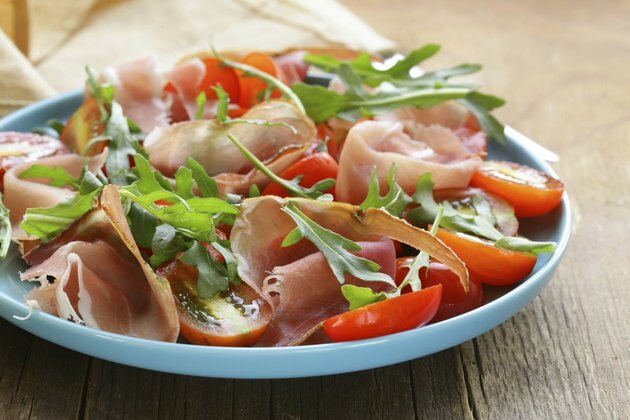 You can also try putting ham in omelets, salads or ham and pea soup for low-point meals.